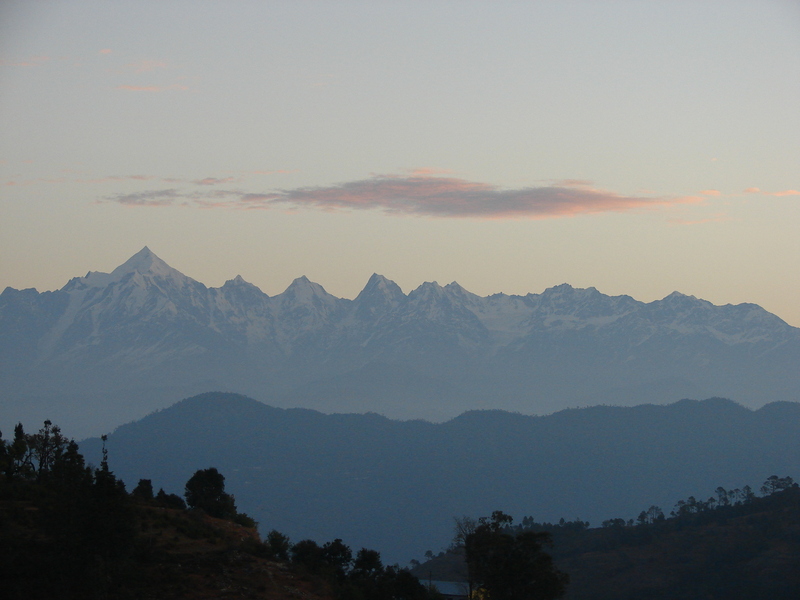 I will never forget the first time I saw the Himalayan range. It was my first visit to Nainital and we were staying at the Swiss Hotel, which sits a fair way beyond the high court on the upper Mallital side. We knew there was a Snow view point that could be reached by a cable car, but we wanted to avoid the crowd. Then somebody at the hotel told us about a more secluded, off beat view point. We got the directions and started off by following a path right behind the hotel which took us to a flight of stone steps. We climbed the steps which led to a road. We started walking or rather climbing the road. When we passed some tourists coming down the road, we knew that we were on the right path. There were villagers carrying wood and calling out to each other rushing pass by us, small kids on their way to school taking short cuts. It was a bright sunny day, but the road was shady due to the thick canopy. We must have walked for about 20 minutes when we came to a sharp turn. And there in front of us lay the Himalayan range, gleaming in the sun. The mountains gave a clear white picture against the clean blue sky. There were a handful of tourists, mostly foreigners enjoying the view from a watch tower and basking in the sun. 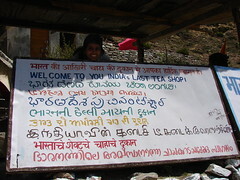 A couple of small shops selling tea, water and biscuits were also around. 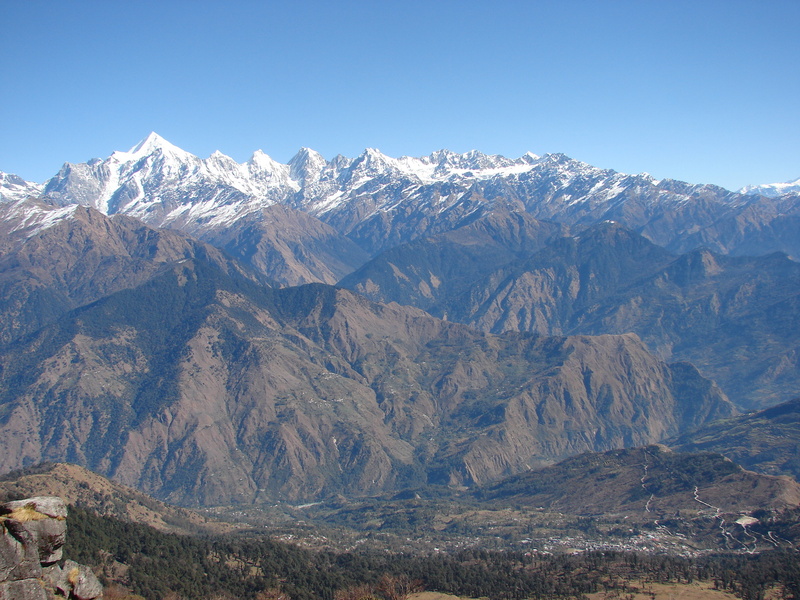 We had with us a postcard carrying all the names and altitudes of the mountains, visible from Nainital, for our reference. 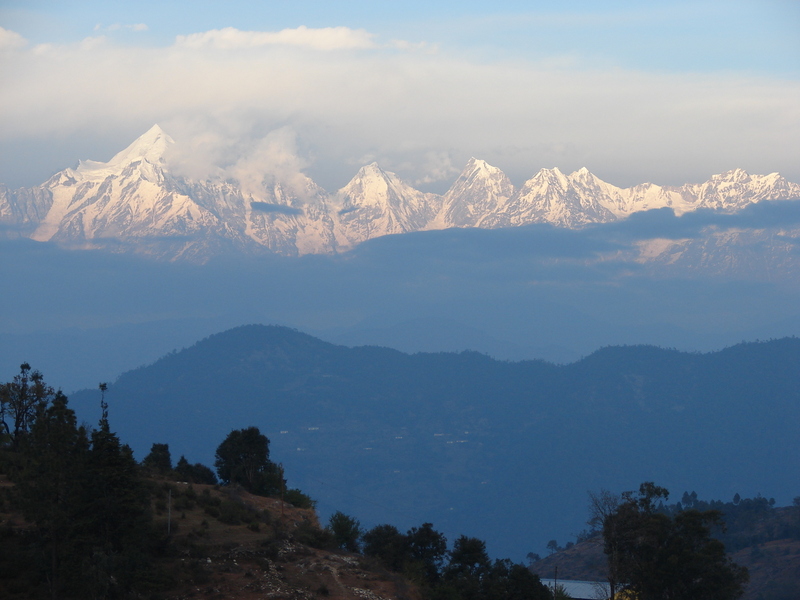 From the left there was Nanda ghunti, Trishul, Mrigthuni, Maiktoli, Nandadevi and its peaks, Pindari glacier, Nanda Kot, Panchachuli and then the peaks of Mt Api in West Nepal. 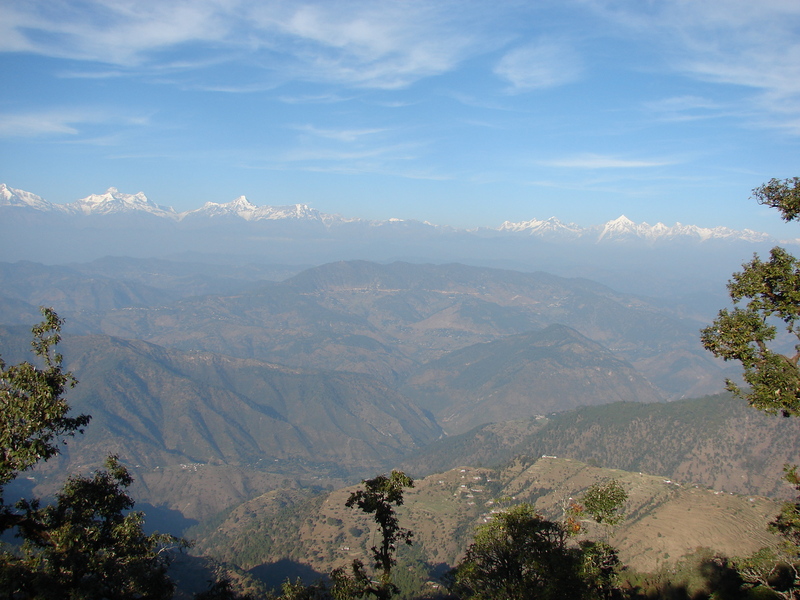 But what stood out, for more than one reason, was the Panchachuli range. The name, the myth, and the simple reason, for the way it looked. 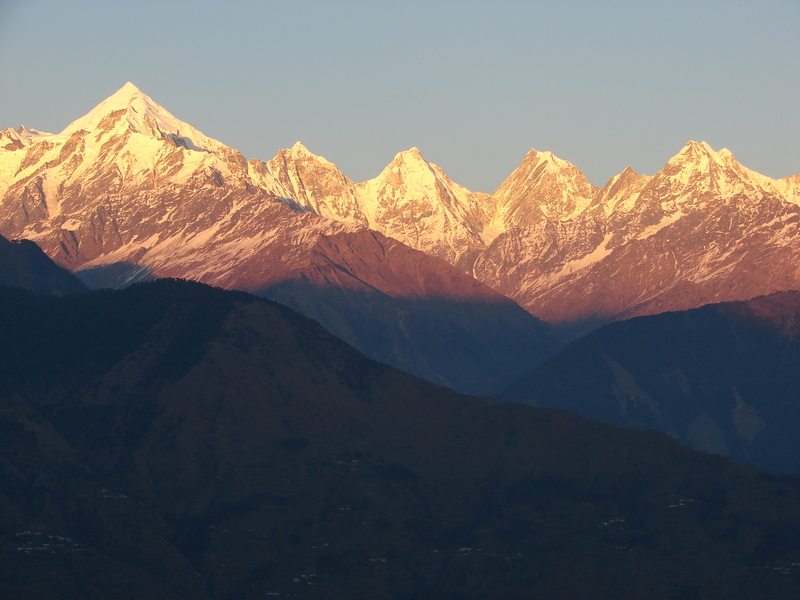 The Panchachuli peaks are a group of five snow-capped Himalayan peaks lying at the end of the eastern Kumaon region. 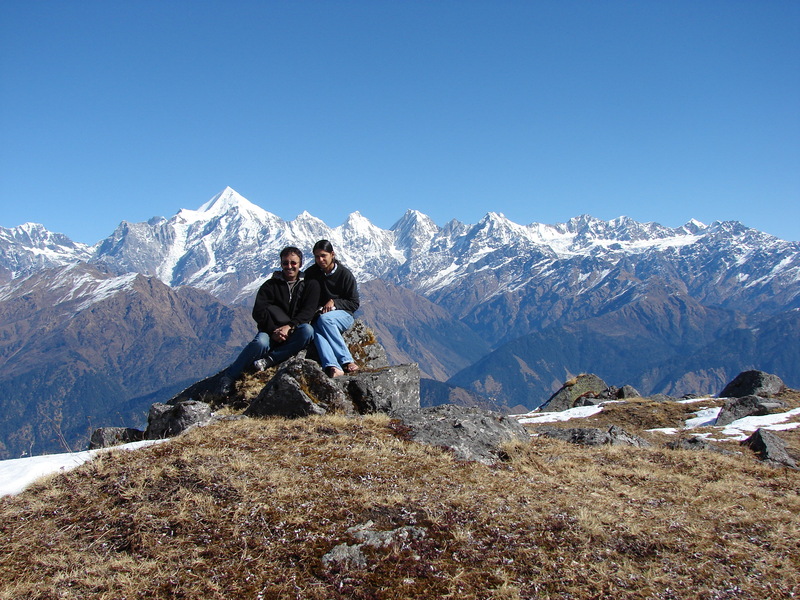 The peaks have altitudes ranging from 6334 m (20,781 ft) to 6904 m (22,651 ft). The name is derived from the legendary Pandavas’ “Five Chulis” (cooking hearths), where they cooked their last meal before proceeding toward their heavenly abode. When I saw the Panchachuli peaks lying there at the end of the graph, five peaks, one after the other, I had this sudden urge of seeing the peaks a little closer. In the following years we made several trips to the hills. 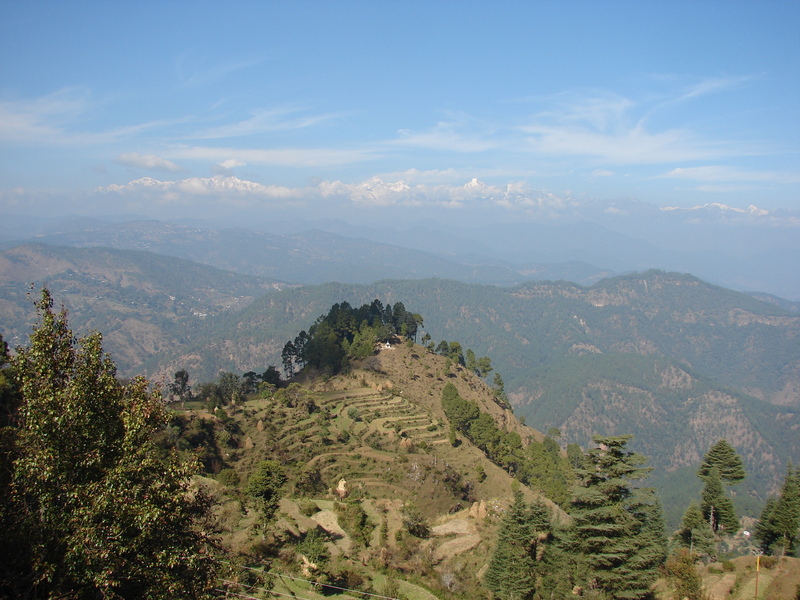 Binsar, Mukteshwar, Kausani being some of the destinations. The mountains never changed nor did the sheer excitement of seeing them. But that clear picture of the five peaks eluded me. 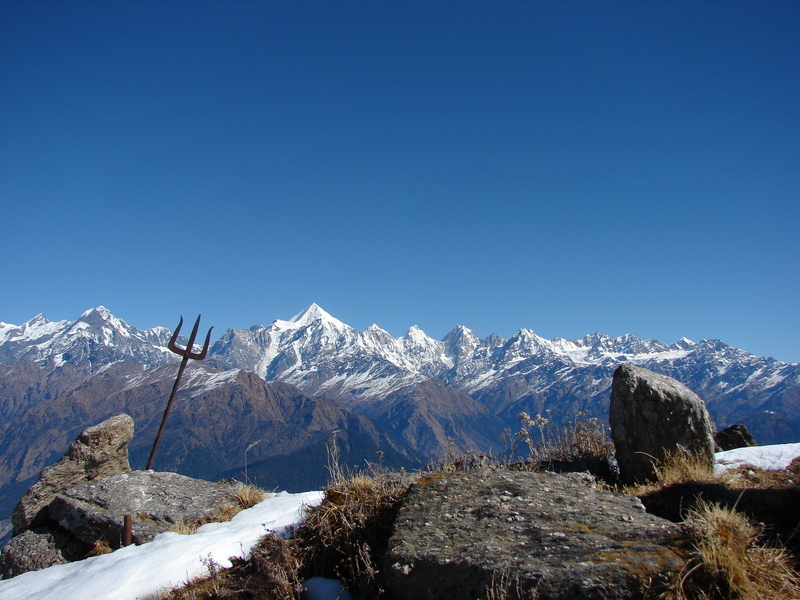 Once while visiting a photo exhibition, I came across a photo of the Panchachuli peaks taken from Chaukori. There were these pretty green cottages arranged in a neat row in a beautiful garden with the mighty Panchachuli peaks in the background. If the photo itself was breathtaking then I could imagine how the real place would be. 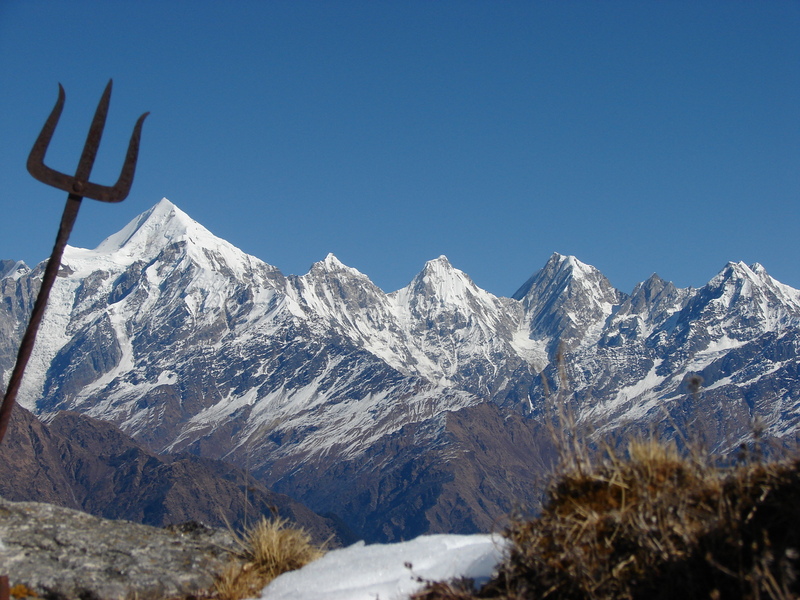 While admiring that photograph I was already making plans to visit Chaukori. 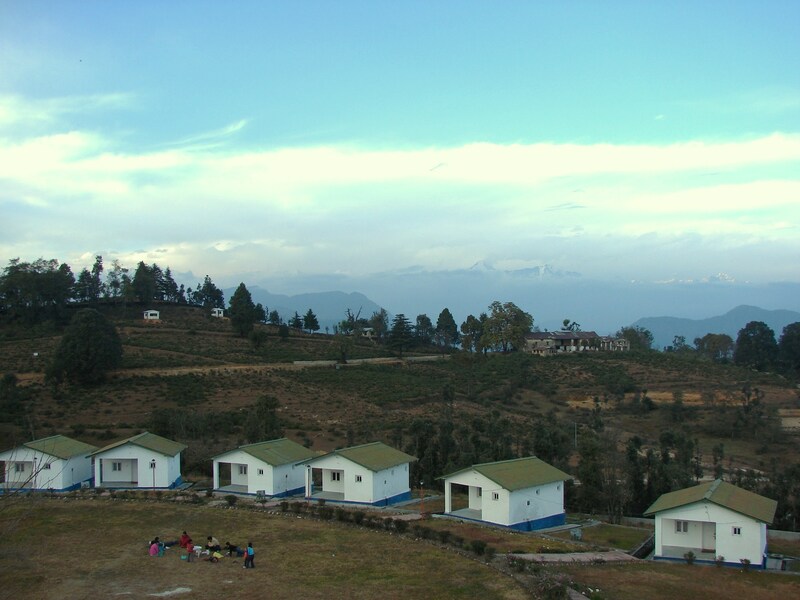 Chaukori, at a height of 6,595 ft, is a beautiful tourist spot with great views of the snow-capped Himalayan range. 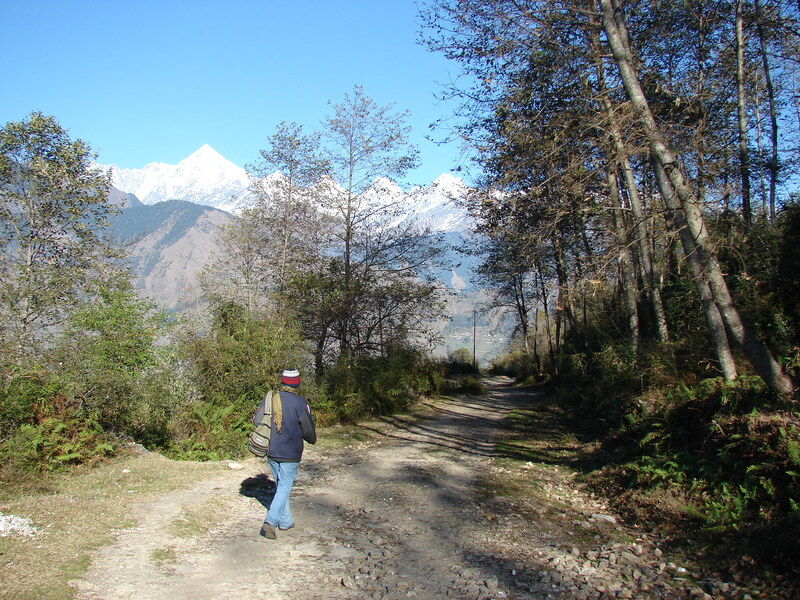 The entire area has a lot of tea gardens and fruit orchards that are simply great for treks. So on a cool November evening we boarded the Ranikhet express from the old Delhi station to Kathgodam. We reached Kathgodam by 6.30. 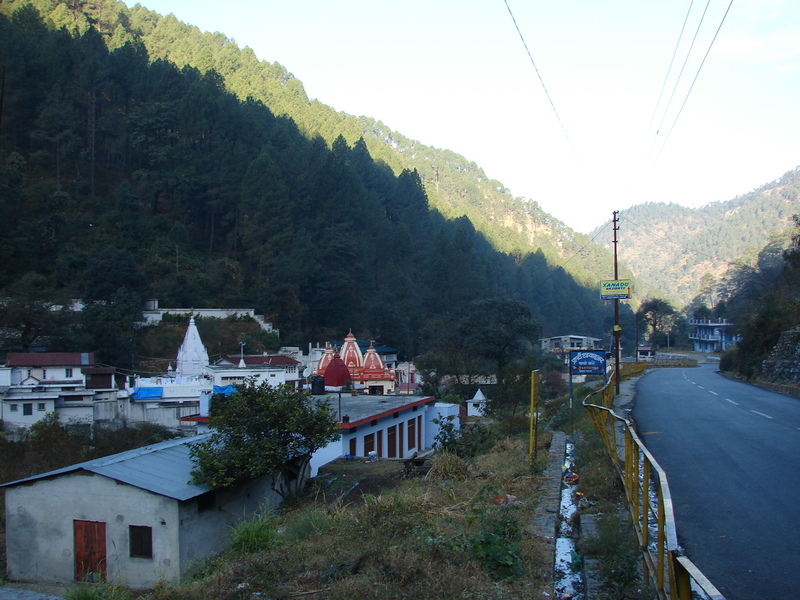 Before 7 we had already caught a shared taxi to Almora. 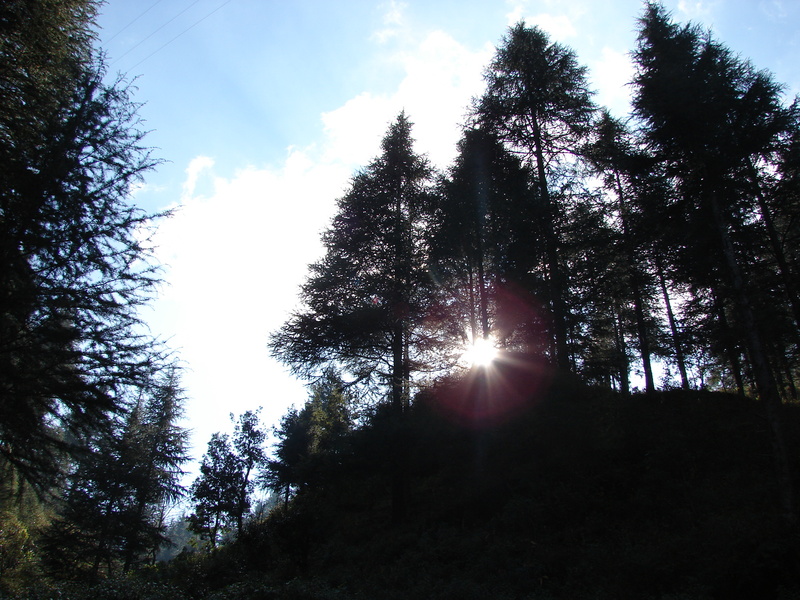 The sun was already peeping through the pine trees and we slowly started climbing our way to Almora. 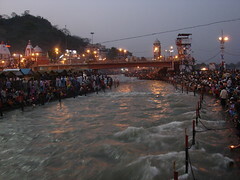 We passed Bhimtal and Bhowali, and then stopped near Kainchi ashram around 8 to have breakfast. By 9.30 we reached Almora. Mist was hanging prettily over this hilly town. We had to walk through a maze of small bylanes and markets to reach the taxi stand. From there we took a shared jeep to Berinag. The jeep was over crowded and cramped. And the driver was still looking out for prospective passengers. At each bump the entire jeep groaned and shrieked. And to add to the agony the agarbatti fumes were making me sick. Though the journey was uncomfortable, the scenery was beautiful and at its best. The mountains were playing hide and seek all the way. The jeep stopped for lunch, that we conveniently skipped, at Dhaulchini. By 2.30 we reached Berinag. Chaukori was just a half an hour drive from there. We reached the KMVN guest house by 3.30. And there right out of my picture postcard stood my favourite peaks. The trees from the picture had grown and were obstructing the peaks a bit. A watch tower was conveniently placed on the grounds of the KMVN guest house. We climbed the watch tower and took in the scenery. 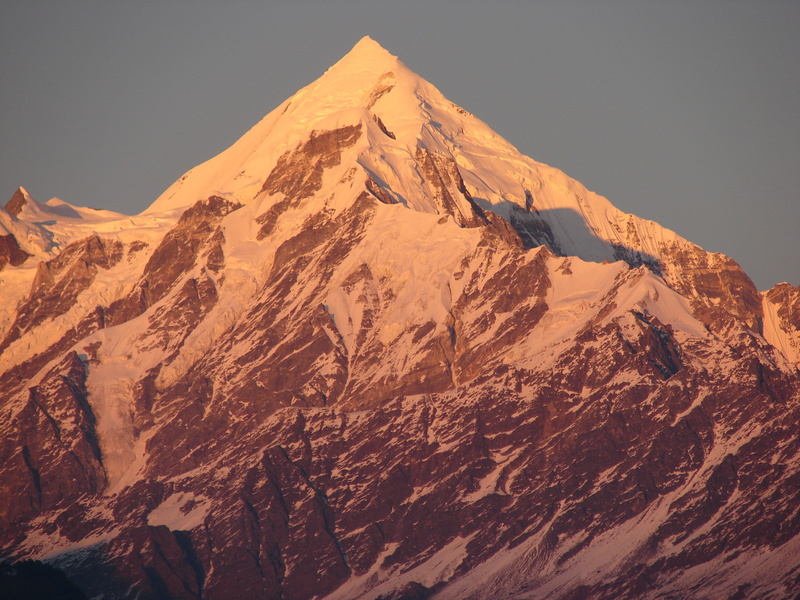 The sun was already going down and the Panchachuli peaks looked pretty in the evening light. Tired and hungry from the jeep journey, we had dinner and slept early. We decided to get up early and explore the premises. We got up before sunrise. Chaukori was slowly waking up to a lazy early winter morning. We took a small path behind the guest house and walked through a tea garden till we reached an open space that dropped down to a terraced valley. 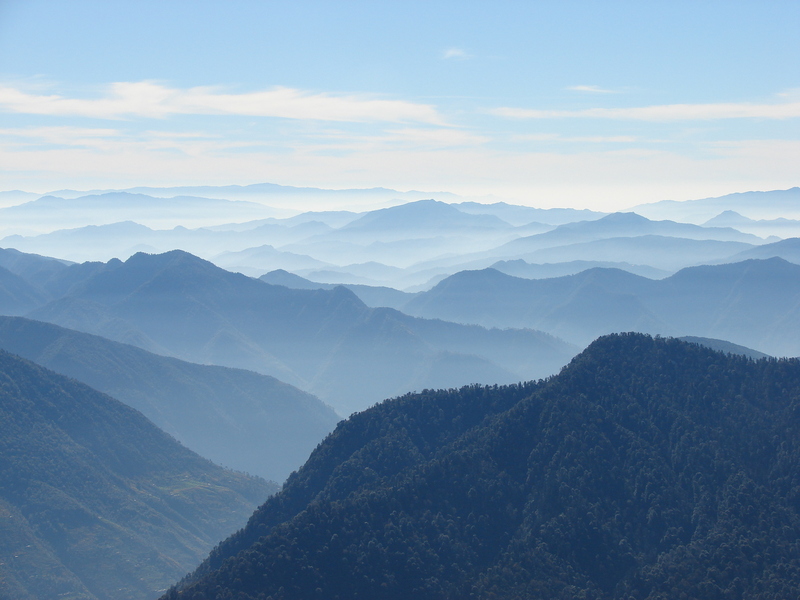 From here the Panchachuli peaks definitely looked more spectacular than I had imagined. 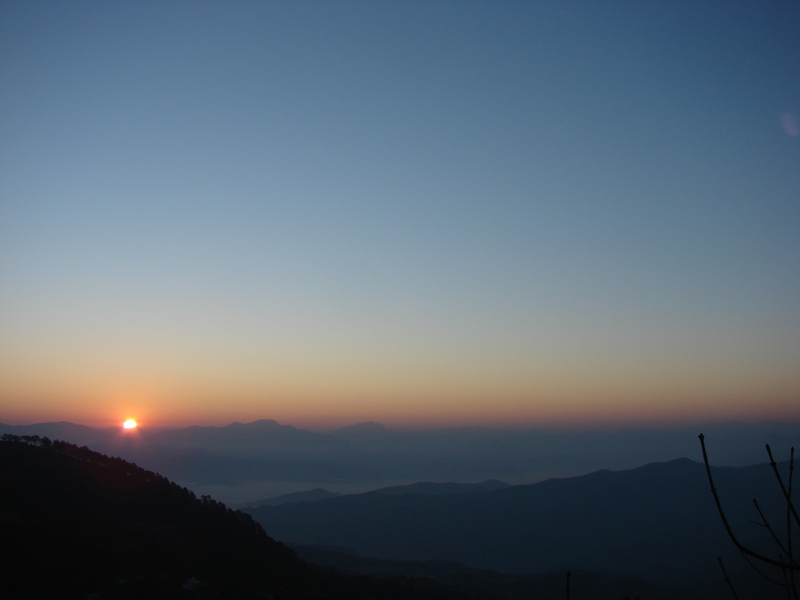 The sun had started to peep over the Himalayan range on the Nepal side on the eastern side. Our camera was doing over time and clicking away. The sunlight had started to fall on the mountains and they looked refreshingly new with every passing minute. The mountains were definitely closer, but I wanted more. We decided to go to Munisiyari for the closest view. The journey from Chaukori to Munisiyari took almost 5 hours. We changed vehicles three times. From Chaukori we took an overcrowded bus to Udiyari bend. From Udiyari bend we took a jeep to Thal. Here most of the journey was downhill. 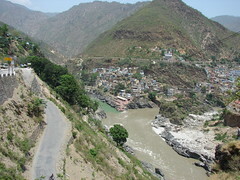 From Thal we crossed a bridge over Ramganga East, walked by a stone Kali temple and came to a bazaar and from there we caught another jeep to Munisiyari. We were starting to climb the hilly road now. 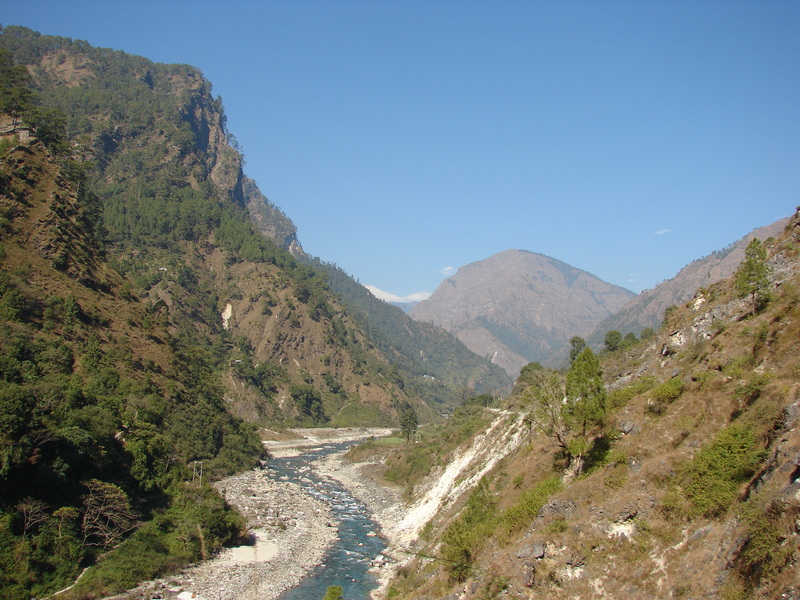 The drive took us past some of the most beautiful valleys and the Ramganga river was accompanying us all the way. Every bend brought a fresh view, often better than the last one. It was amazing how the slightest change in elevation altered the perspective completely. 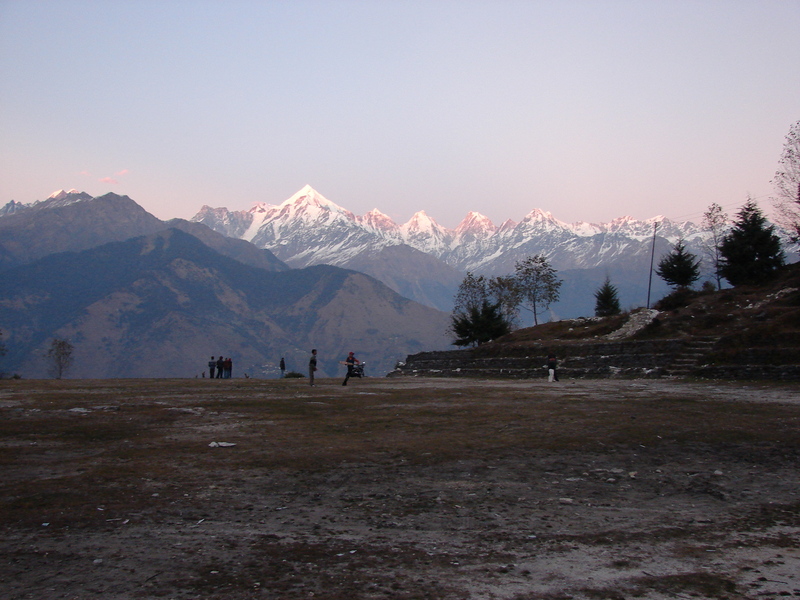 Munisiyari, situated on the banks of Goriganga river, is a favourite destination for high altitude trekkers and nature lovers and is commonly used as a base camp. By 1 we reached Munisiyari. 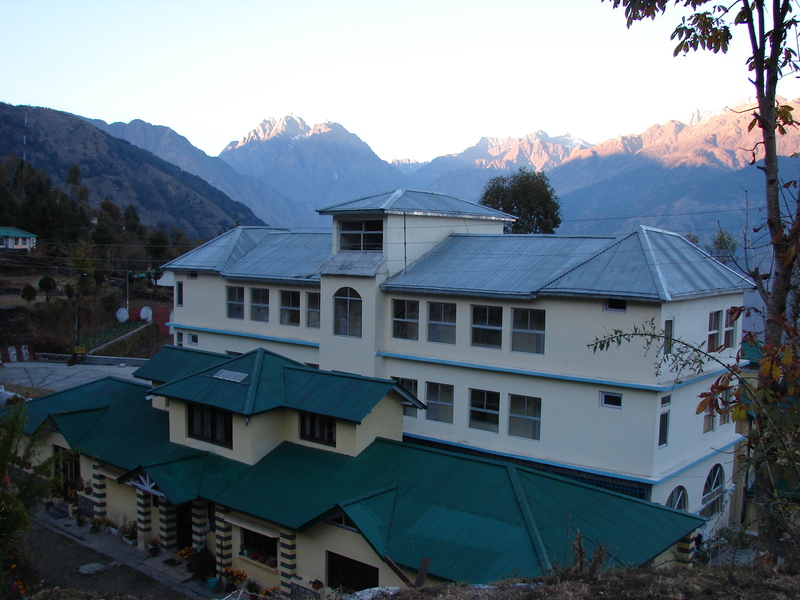 The guest house was a building with green roofs right out of the Raj era. 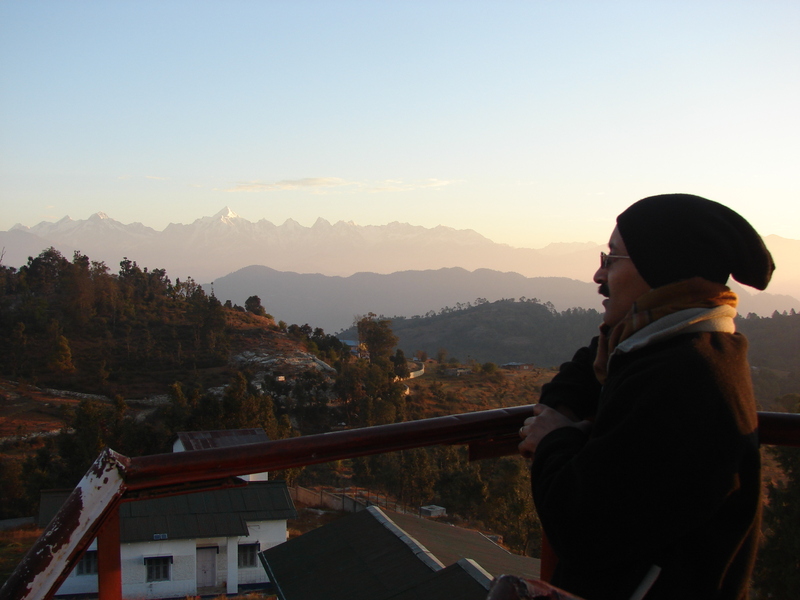 And to add to the beauty of the guest house was the magnificent sight of the Panchachuli peaks. We checked in, and our room had excellent views of the 5 peaks. 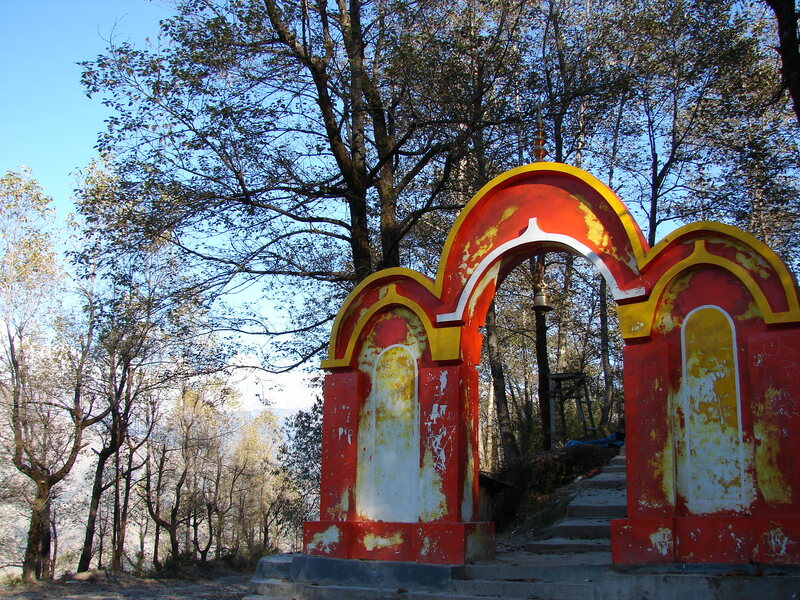 After lunch we decided to see the local Nanda Devi temple which promised us better views of the peaks. It was a 45 minute walk from the guest house. Our walk first took us through the crowded market lanes. After getting directions from a shopkeeper we continued looking for a petrol pump. From the pump we walked straight into a meadow. Right ahead we could see a wooded area beyond which were the the steps to the temple. 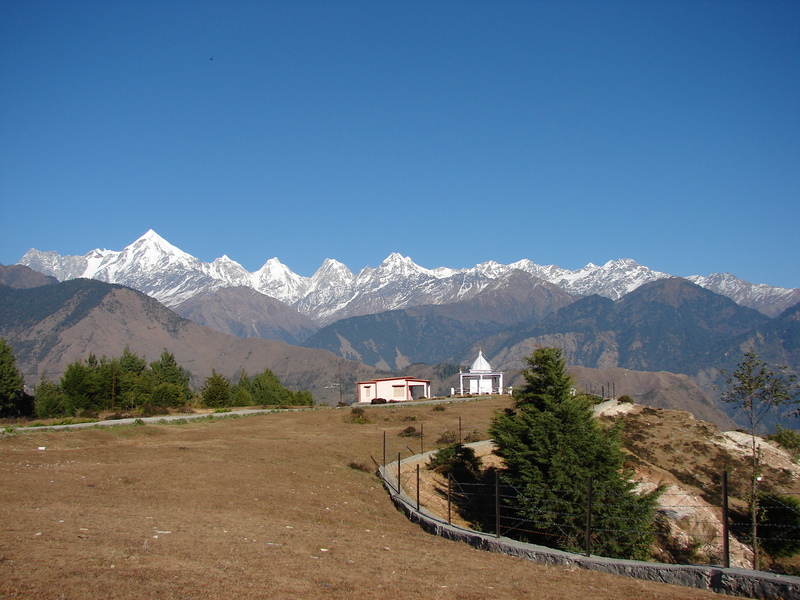 Perched on the edge of a small hill was the Nanda Devi temple with the peaks in the background. There were deep valleys with houses ahead. We could see the Goriganga river at a long distance in the valley. There was no one around, other than some grazing cattle and langurs in the woods behind. But there was this eerie feeling of being constantly watched. Maybe the peaks were watching us. 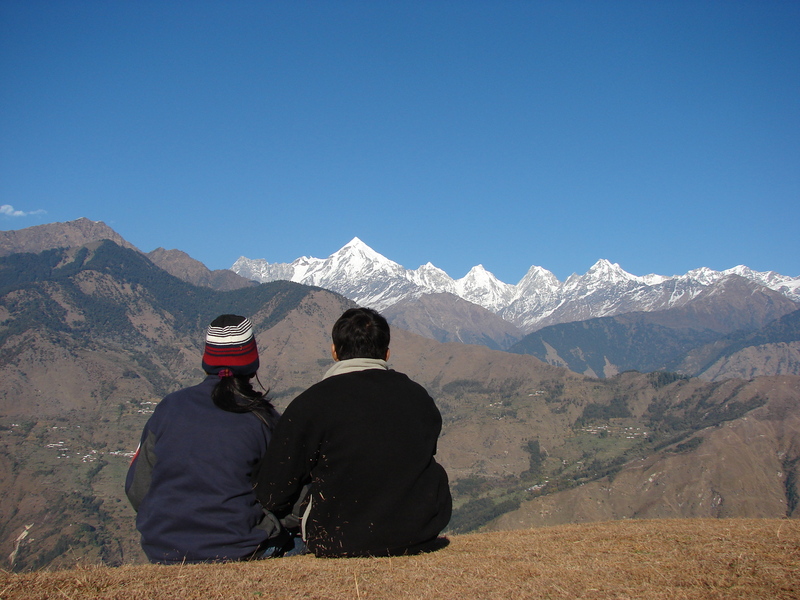 We sat there for about an hour, gazing at the peaks, taking photos, inhaling the sweet mountain breeze and enjoying the silence. While walking back to the village we passed a lot of women with all their wares on their backs going back home after a busy day at the market. We walked up from the village to the school ground which also serves as a helipad. By then the sun had begun to set and the peaks were changing colours from gold, to orange, to red and finally pink. The ground was bustling with all kinds of people. There were other tourists who were enjoying the sun set and a lot of kids who were playing cricket on the grounds. We had planned a day trek for the next day. So we had our dinner early and slept. The next day after having an early breakfast, we started from the guest house around 7 am. We had packed lunch and snacks with us. 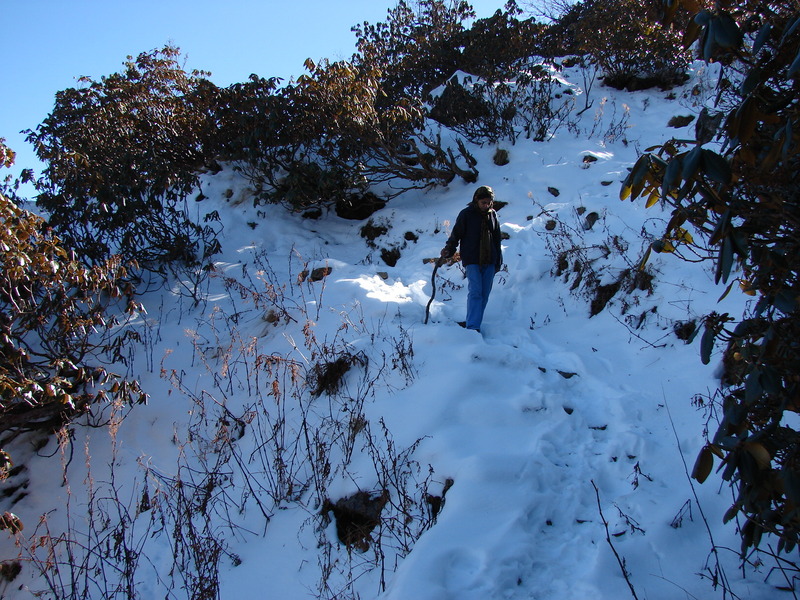 Bhuvan, an employee at the KMVN guest house, had agreed to accompany us on this trek. Being a localite he knew well about the area and had done the trek many times before. From Munisiyari we took a jeep to Balati bend. From there Khuliya top was 8 km. We started the trek around 7.30. We took a stone path from the road that led us through some pretty woods. Steps were made into the path wherever necessary. The climb was fairly easy but we were panting in no time. But the cool mountain air could only energise our spirits. We rested in between, took photos and enjoyed the scene. 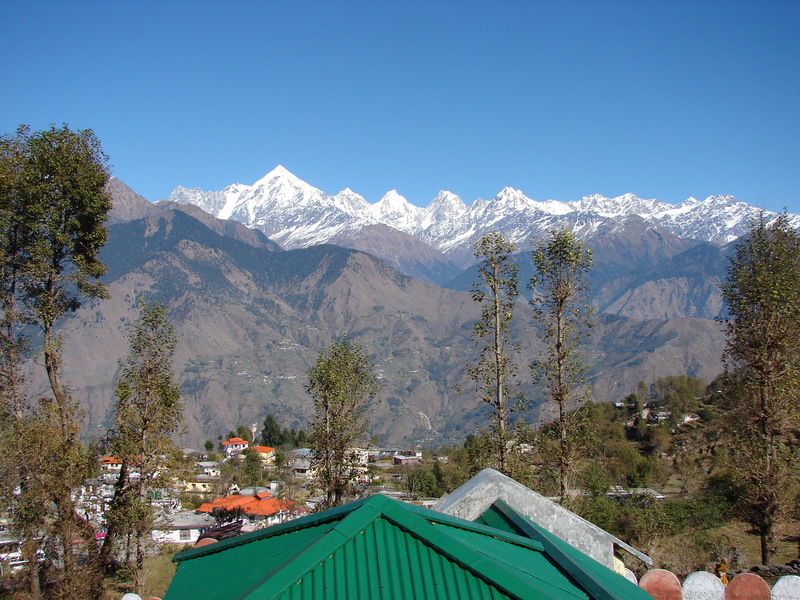 View of the village and the peaks during the trek. The helipad is seen on the lower extreme right. From certain points the whole village was visible. We could even spot the helipad and the Nanda Devi temple we had visited the previous day. 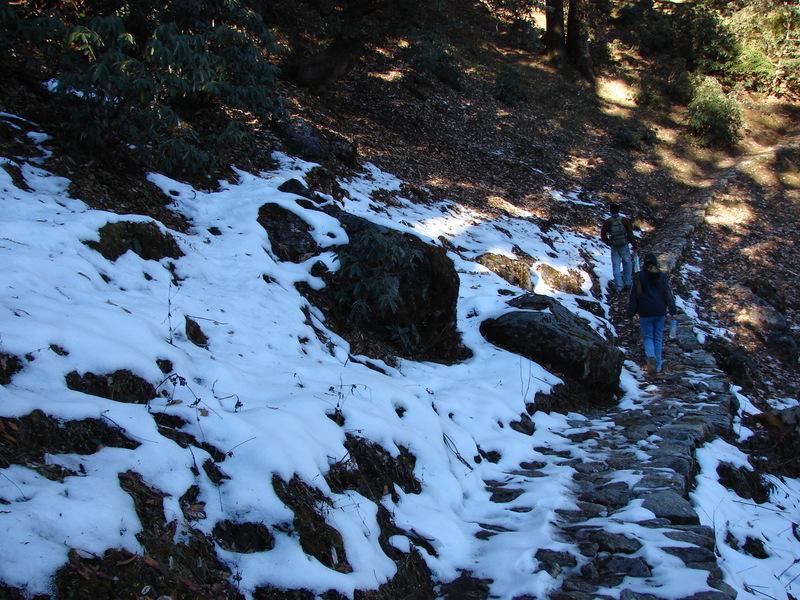 It has snowed 2 days back, so we had to walk over snow at some places on the way. The snow had started to melt and it was soft and slushy. 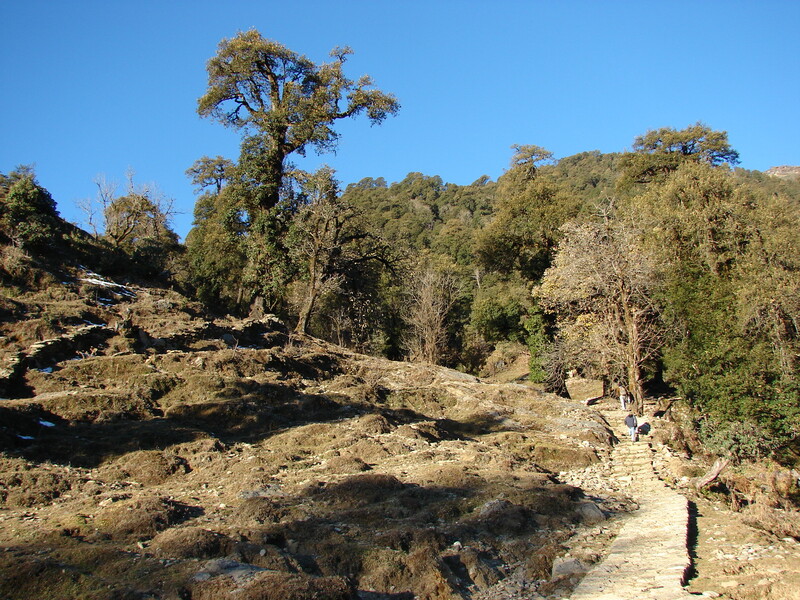 The woods had a luxuriant mix of Pine, Deodar, Oaks, Spruce and Cypress, but the main vegetation we came across as we gained height were the Raapta trees. In spring the whole jungle turns red with the rhododendron flowers. We were not lucky enough to see them in full bloom. We spotted some monal pheasants and langurs on the way. Around half way on the route is a guest house. 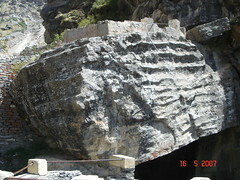 When we took the trip in November 2008, the guest house was under construction and to be completed before new year. We sat on the steps for a while, had tea and snacks and continued our walk. As we climbed up further the vegetation suddenly changed. The woods gave way to grass lands. The air was getting cooler and we knew we were approaching the summit. Suddenly we came to a pastureland. The snowcapped mountains were fringing the skyline on one side and on the other side were these endless undulating hills. It took us 4 hours to reach the top. We sat there for an hour and had our lunch. The descent was more easier. We took shortcuts and reached the road by 2.30. We waited for a jeep for an hour and then decided to walk down to Munisiyari. Instead of following the road we took shortcuts and passed through villages and fields and finally reached the guest house at 5. The sun was about to set and this was our last day with the peaks. Was this the closest I could ever get to the Panchachuli peaks? 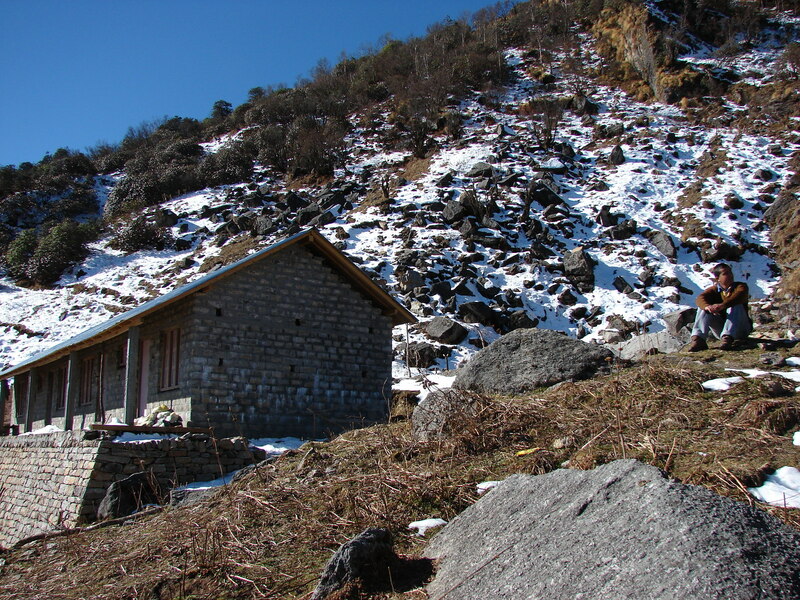 I knew there were treks to the Panchachuli base camp and even further up for the adventurous. I don’t think I’m ready or equipped to climb a mountain. But a trek to the base camp sounds interesting. 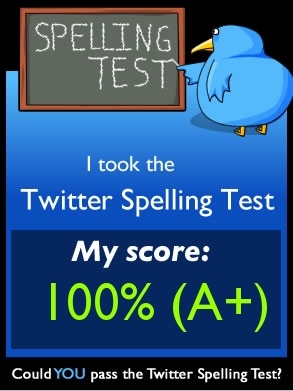 There is always a next time….